Students passing by the Cabot Science Library on the morning of Tuesday, Dec. 5 likely had to adjust their earbuds as the music of flutes, violins, and guitars emanated into the hallway. 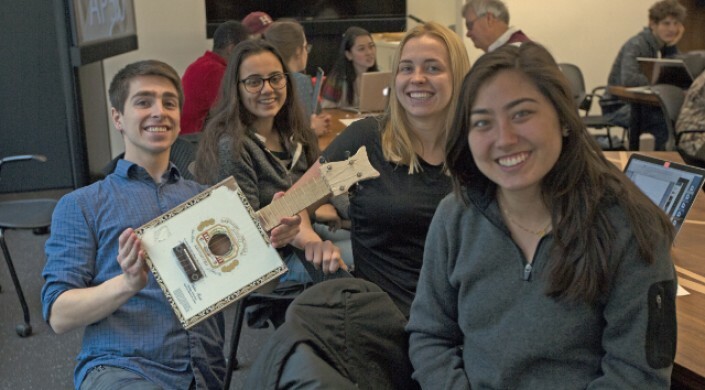 The Harvard John A. Paulson School of Engineering and Applied Sciences (SEAS) undergraduate course Physics as a Foundation for Science and Engineering (AP 50) was holding its annual “Symphosium,” an event featuring the handcrafted instruments of AP 50 students for their unit on harmonics. AP 50, a course designed by Eric Mazur, Balkanski Professor of Physics and Applied Physics, currently taught by Lecturer Kelly Miller, stands out for its focus on innovation and group work. Featuring a flipped classroom method, students prepare for class through reading and problem sets, but spend class time teaching each other through experiments, evaluations, and design projects. Their most recent unit featured the study of waves and oscillation, so students were challenged to design an instrument that cost less than $20 and could produce two full octaves of sound. “The origin of the project comes from the work of El Sistema, a music education program founded in Venezuela,” explained Miller. Children enrolled in El Sistema’s youth orchestras make beautiful music from homemade instruments, crafted with metal and wooden scraps—parts often found in junkyards. AP 50 aligned its Symphosium project with this mission: create a playable, inventive instrument built on the principles of harmonics, but constructed with inexpensive and recyclable materials. Grant Riew, A.B. ’19, a human evolutionary biology concentrator, helped build a Chinese violin, called an Erhu, using only scraps of wood and cardboard found in the Active Learning Labs. “I play the cello and saw a video of a man playing the Erhu on a subway, so I was inspired to make one,” he said. Brooklyn Davis’s team, on the other hand, chose a wind instrument. “One of our team members played the flute so we decided it would fit well for the musician and the budget to design a flute out of PVC pipe. We learned to work with our strengths,” said Davis, A.B. ’20, an environmental science and engineering concentrator. Other instruments fabricated by the students included iterations of guitars and banjos, a didgeridoo, and tuned percussion pieces. The judges in attendance included numerous members of the Harvard Physics Department and the Applied Physics Area at SEAS, each of whom was chosen for their unique expertise in the subject matter. “All the judges are physicists who are also musicians,” Miller said. During the Symphosium, not only were students required to play their instrument for the judges, but also explain their data of measured sound intensity, frequency, and beat frequency, along with their design considerations. Students, judges, and passersby alike delighted in the music, understanding, and pride expressed by the instruments.